January is always a slow blogging month for me because I've pretty much used all my blogging energy for my Daily December challenge. So I gave myself a whole week off, and I'm gonna try to do a M-F photo of the day challenge. No pressure to blog on the weekends. Probably lots of photo blogging from my phone. I've mentioned before about my unexplainable phobia of cranes. Not entirely sure why I literally go into a panic attack whenever I see one, but I like to blame it on a past life accident, LOL. I'm not afraid of heights. I love architecture, tall buildings, walking on glass floors 40+ stories high - like at the CN Tower in Toronto or at the top of the Sears Tower in Chicago and flying up high in the sky and looking down at the vast landscape below, so really...not sure why I hate them so much. 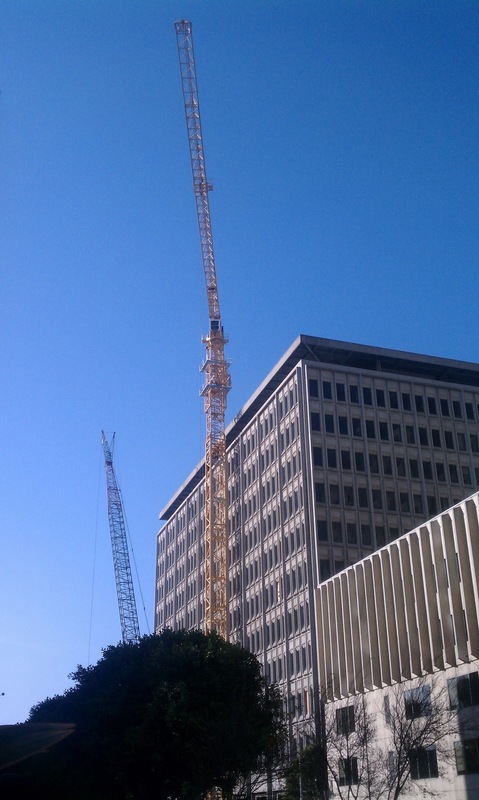 I have a fear that whatever the crane is carrying will fall on someone and smash 'em like a bug. Or that the crane itself, which looks so very unstable to me, will tip over and fall on someone and smash 'em like a bug. It's happened before so those events justify my irrational behavior. Anyhoo...there are a lot of cranes in this city. Lots of building happening. I just walk by them, usually on the other side of street, and pretend they're not there, keeping my eyes on the sidewalk. Well, when we moved here a year and a half ago, we noticed that the 20ish story building across the street was vacant and appeared to be abandoned. The 1st thing I thought of when I saw it was...they're gonna tear that building down while we're living across the street and I'm gonna have to face my fears up close and personal. This is my view when I immediately walk out the front doors. I have never seen a crane as tall. Does the crane driver have to climb up the frame to get to his cab?